Looking for unique and one-of-a-kind curtains and upholstery for your home? Head out to Anokhi on Russel Street. 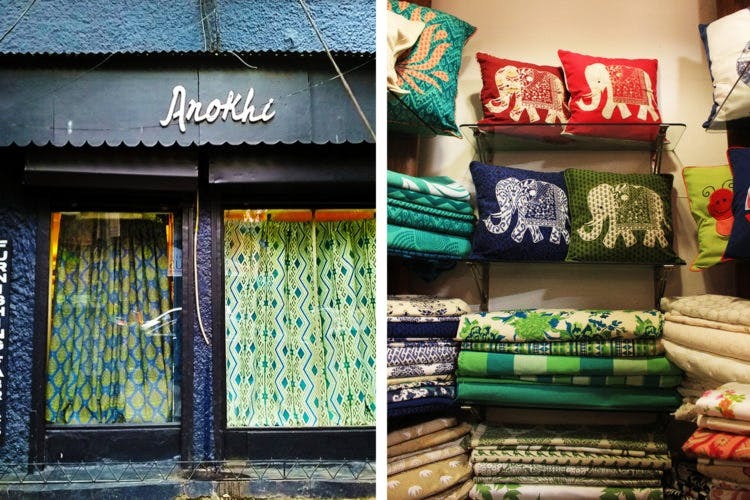 If you want to deck out your casa in interesting and standout fabrics, head out to Anokhi. This cosy little store at the end of Russel Street is almost 46 years old! You can’t miss this gem – it hugs this huge tree around which they have constructed the store because they didn’t want to cut it down. You will fall in love with their silkscreen prints on cotton, voile, and linen that will have your interiors looking so good that visitors will ask for permission to sit on the sofas! Their style is traditional and innovative, all of the work is handmade so they can ensure the design, quality and service are of the highest standards. The prints are elegant – like paisleys, and Mughal floral prints and bootis, and some that look like a William Morris work, chintzy florals and eye-catching geometrics that look very contemporary and edgy. Their fabrics can be used for curtains, to upholster sofas and other seating arrangements, for making charming window blinds, and more. Just walk in and choose from the furnishings on display – in case there’s a specific colour combination you are looking for or if you like a particular print but would prefer it in a different shade, Anokhi will customise it for you. Let them create your perfect curtains (and blinds) – simply choose your favourite fabric, send us your measurements and they’ll do the rest.